Less than one glass of (fantastic) rosé into the first-timers happy hour, the conversation turned to the friction between personal values and organisation values. This is not a conversation I have at happy hours with my non-philanthrofriends; in fact, this friction is a delicate one to discuss in most circles. And yet, it’s critical, both for unlocking thoughtful strategy and programming decisions, and for self-nourishment. When you work in philanthropy infrastructure, there are only so many people that instinctively ‘get’ you, and they were at the United Philanthropy Forum conference. I’ve always said that to be successful in philanthropy, you need to have sound judgement; the best way to grow that muscle is through active conversation (with a balance of listening and sharing) with peers. We need to more actively create spaces for peer learning for ourselves and for our stakeholders. When you work in philanthropy infrastructure, there are only so many people that instinctively ‘get’ you, and they were at the United Philanthropy Forum conference. The same is true for when you work in philanthropy more broadly. When I was a funder just starting my career, I needed to seek out happy hours for other new grantmakers (thanks, EPIP!) so that I could share a challenge or success without having to give 15 minutes of context. We work in a well-networked but still small niche sector, and which contributes to the (false) assumption that each entity in that sector is a ‘special snowflake’ or — more simply put — unique. In turn, this creates a culture where it’s less instinctive to share what we’re learning with one another. But it’s profoundly empowering to be surrounded by people who ‘get’ you, and it’s easy to see that there’s more in common than is different between organisations. When asked about common roles we play as mid-level practitioners, motivator, translator, connector, consultant, and ‘Debbie Downer’ (re-named later by peers as — quite simply and accurately — realist) surfaced. And through that first-timers happy hour, questions about advocacy, transparency, managing up, and making time for fitness (and which kind! Orange Theory or CrossFit? Running or yoga?) were shared by all, opening the door to productive discussion and troubleshooting. The best way to grow the muscle of sound judgement is through active conversation (with a balance of listening and sharing) with peers. One challenge that surfaced throughout the conference was the struggle of advancing new ideas while honoring experience, history, and stakeholder perspectives. This challenge was amplified among younger and new/mid-level staff, though it is shared across the board. It is always easy to point out problems to be solved and needs to be met, but it’s much harder to implement solutions with proper process and buy-in, and in balance with other priorities. (Speaking of which, another challenge clearly shared by many: everything feels urgent. Insight: we do this to ourselves.) It’s often hard to push past this roadblock in dialogue with colleagues, but our home-life partners and friends aren’t often well-positioned to help us navigate these challenges, either. 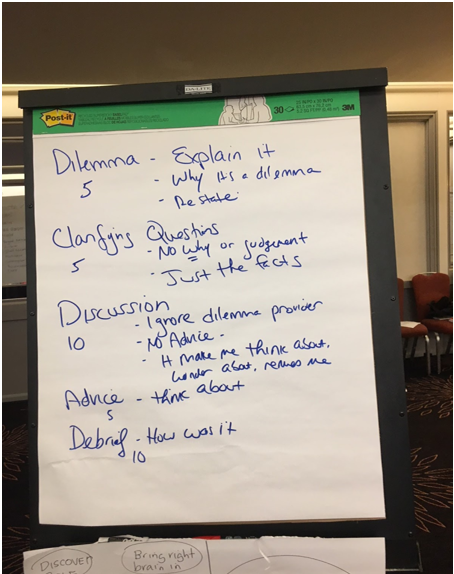 In our mid-level practitioner session, facilitators extraordinaire Mark Sedway and Audrey Haberman from The Giving Practice offered an adaptation of a peer consultative framework (see image). Together, a group of eight strangers offered substantial insight into a challenge one of us was specifically facing, but which we all agreed in the debrief gave each of us useful perspective for our own manifestations of similar challenges. I’ve used a similar model several times before, and I’m always especially struck by how it forces a high level of listening and then reflecting without reacting. It’s easy to jump to conclusions or get pigeonholed into one way of thinking without a clear framework (part of why I love human-centered design, too), so structured dialogue like this can point to solutions, validate our instincts, and build problem-solving capacity. We need to more actively create spaces for peer learning for ourselves and for our stakeholders. This was my action-oriented ‘aha’ moment. Without recurring spaces for peer learning, there’s a lot of personal and organisational growth that is missed. We hear that mentorship and sharing what you know are generally good things, but unless there is time blocked on our calendars each month, these are the first things to get deprioritized. We find hacks for solving problems on our own and venting to our friends, rather than actually working smarter through connection with peers. Those attending the United Philanthropy Forum conference are well positioned to offer their stakeholders opportunities for connecting in safe, clearly defined spaces, and foundation leaders are well-positioned to not only allow but encourage their staff to participate. Together, we can build a more robust framework for learning through candid dialogue. So, whether you work in philanthropic infrastructure or philanthropy more broadly, talk to your people. Our people. It will help you, your organisation, and the field move farther, with more efficiency and greater intention. (Especially when paired with equally active dialogue with the communities in which you work!) The conference was a great place to start, but not everyone can go to these conferences; it’s incumbent on all of us to keep the discourse flowing. Thanks Jen for the insights. I've come to the conclusion that actually the real problem is not so much about the fundraisers creating networks to talk to each other, but more about the educating charity managers and trustees, who do not understand the value added by the fundraiser. In New Zealand, where I'm from, I'm convinced that the most productive way forward is to do more training for the managers and board chairs. That's the conversation I'm hearing from fundraisers in our country.